Today on the Aurora we headed back up north towards Thacher Island. We had another great day of whales! It was a bit windy and choppy but we were able to find humpbacks Echo and Nile and spend lots of time with them. 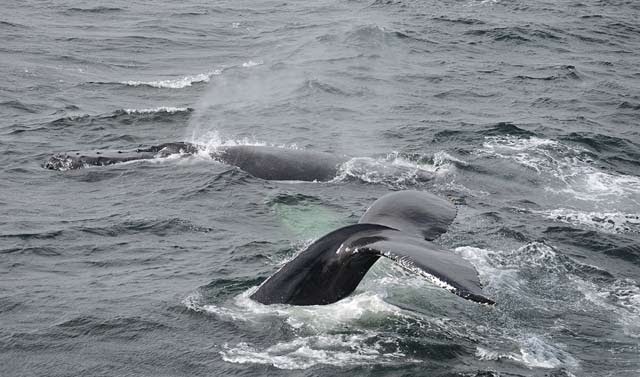 The pair was surfacing and fluking side-by-side, deep feeding and traveling a bit. While observing these two, we had two minkes pop up nearby. During the latter portion of the trip, we saw a spout in the distance, so we tried to make out way over and get a closer look, but the whale never showed itself. At this point, it was time to turn back to Boston, and as we were leaving another pair of humpbacks fluked in the distance! It was a quick look and too far away to identify, but it was great to know there were so many whales scattered about the area. Total whales today included two minkes, two pairs of humpbacks, and an unidentified larger whale.